When you drive up to Glenglassaugh, it looks like a fairly ordinary Scottish distillery. There’s a modern visitors’ center, a few historic buildings and dunnage warehouses, some larger warehouses from the mid-20th century, and nice if modest scenery surrounding it all. Charming, sure—but nothing special. 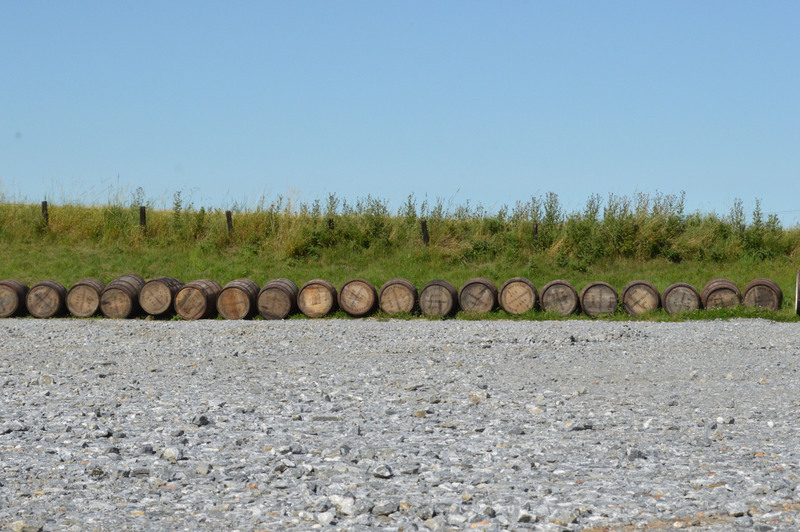 Take a wee walk past the distillery, though, curving left down a paved drive that quickly turns to dirt and gravel, and you’re met with a stunning view of the coastline, complete with craggy cliffs and an undisturbed beach. It’s otherwise completely hidden, with no hint at how close the distillery sits to the North Sea besides the occasional whiff of salt air. When I visited, someone had set up a tenting campsite in a sheltered cove—a phenomenon that seems bizarre to an American, so used to our country’s culture of no trespassing, but that’s completely normal in Scotland where the Scottish Outdoor Access Code means one can plonk down a sleeping bag and campfire just about anywhere. Discovering this picturesque scene set the tone for my visit to Glenglassaugh and made it one of the most memorable of the trip. 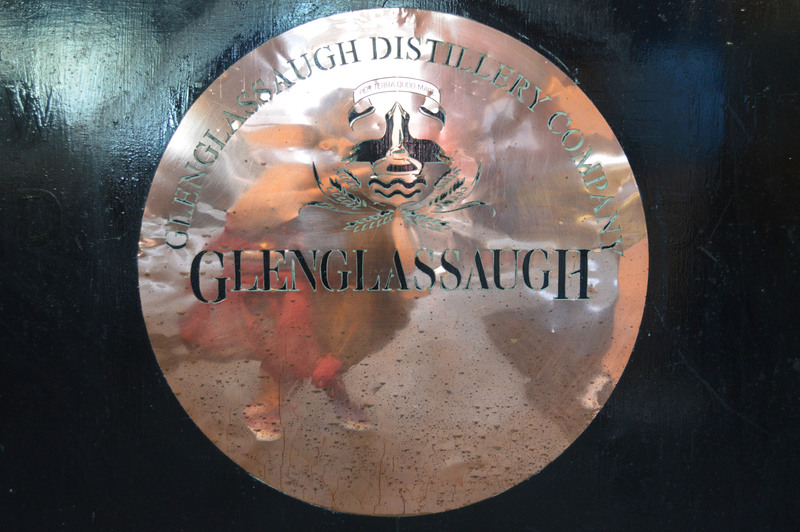 Glenglassaugh was founded in 1875 by Colonel James Moir and sold to Highland Distillers shortly thereafter, in 1892. It produced until 1907 and then was mothballed (though it continued making malted barley, presumably for Highland’s other brands, Glenrothes and Tamdhu, until 1922), according to Ian Buxton. His book, Glenglassaugh: A Distillery Reborn, notes that there’s some evidence it produced for another few years in the 1930s, but most likely production didn’t start back up until 1960. 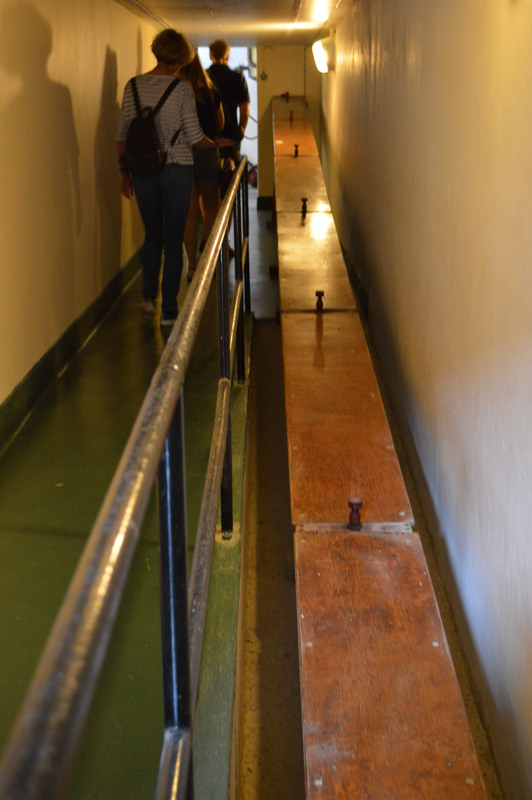 During WWII, the distillery’s buildings were used by the military, and there are still concrete bunkers down by the beach where defenses were set up. 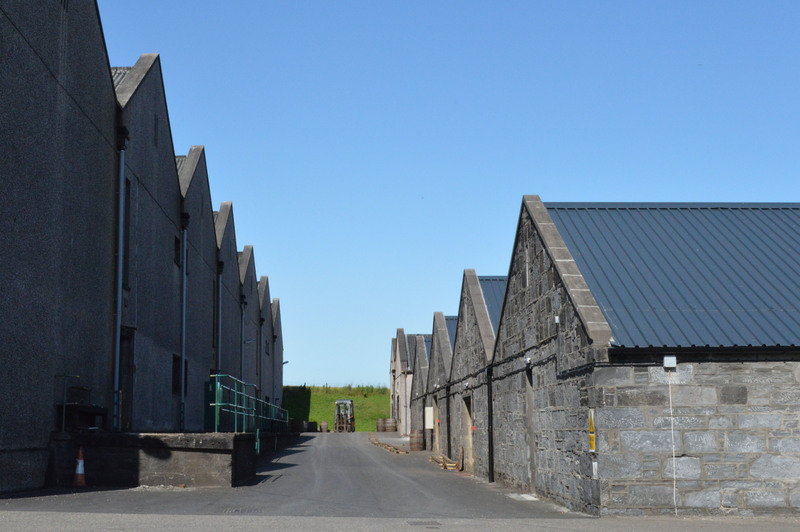 Highland Distillers reopened Glenglassaugh in 1960, after razing most of the old buildings (including the stillhouse and several warehouses) and replacing them with more modern structures. From then until the distillery was mothballed again—like so many others—in 1986, most of the whisky produced there went into the Famous Grouse and Cutty Sark blends. After Glenglassaugh closed the second time, its single malt became available occasionally via independent bottlers. After coming out of the malt bins, the grain travels along this fun wooden pipe. In 2008, a Dutch company called The Scaent Group bought the distillery with the idea that it’d make a good investment—whisky being on the upswing internationally—and so it did. The Scaent Group sold Glenglassaugh for a tidy profit in 2013 to Billy Walker, who also owns BenRiach and GlenDronach and who has a keen sensibility for reviving promising brands. The year he bought it, Glenglassaugh put out about 600,000 liters of spirit. When I visited in July 2014, they expected the number for that year to increase by 50 percent to 900,000 liters. Because of its spotted history, Glenglassaugh is a strange mix of historical and modern. 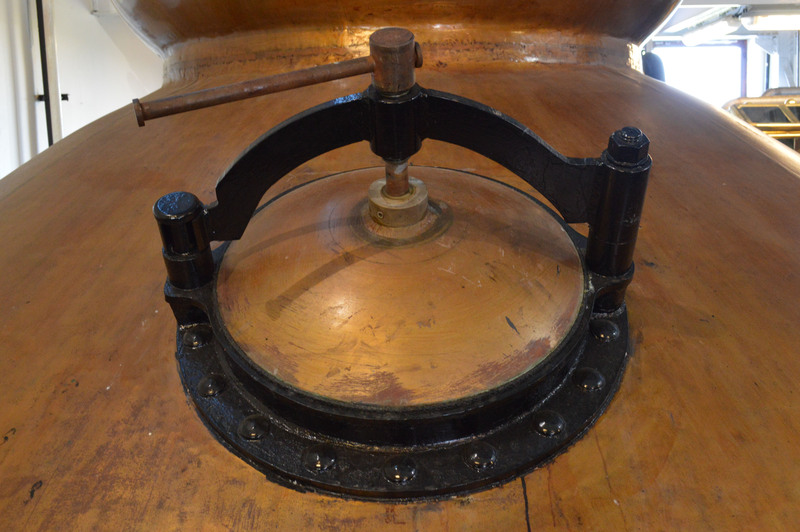 For example, some of its washbacks are wooden, made of Oregon pine and dating from the mid-century reopening, while others are stainless steel, presumably replaced in 2008. 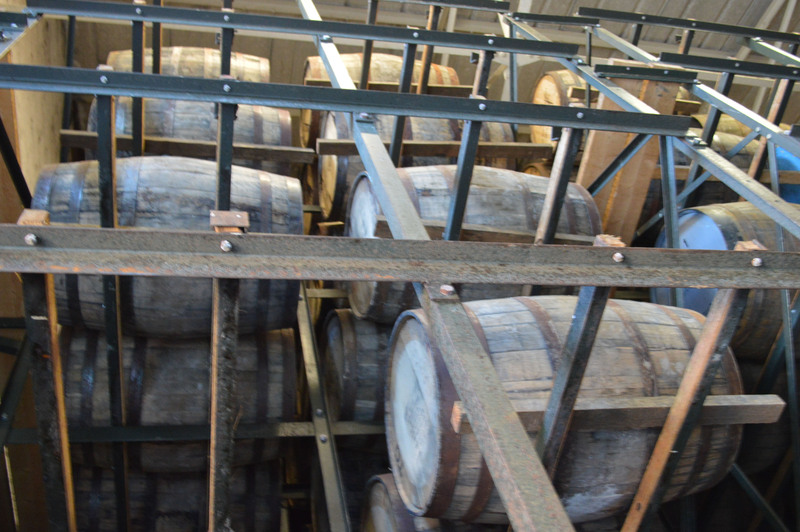 The distillery hasn’t decided whether to continue replacing the wooden ones with stainless or to revert to using all wood, opting for the wait-and-see approach. 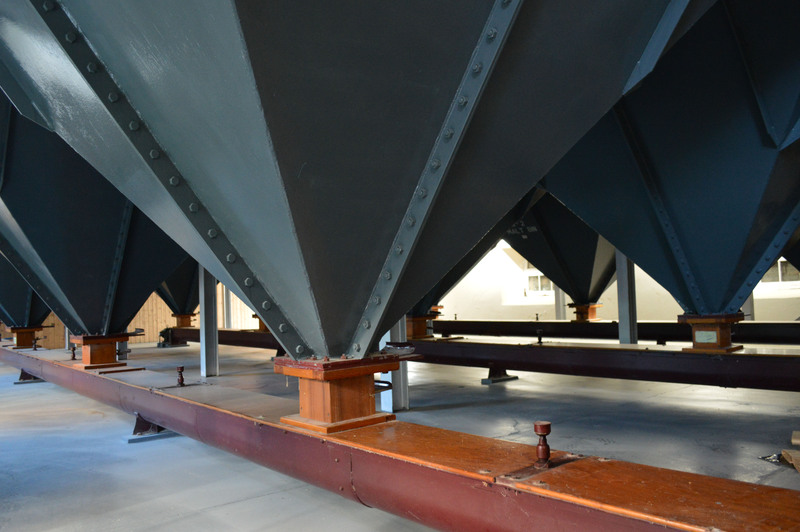 When you take the distillery tour, you’ll get to access the stillroom via a catwalk above the floor—a completely different view of things than normal. 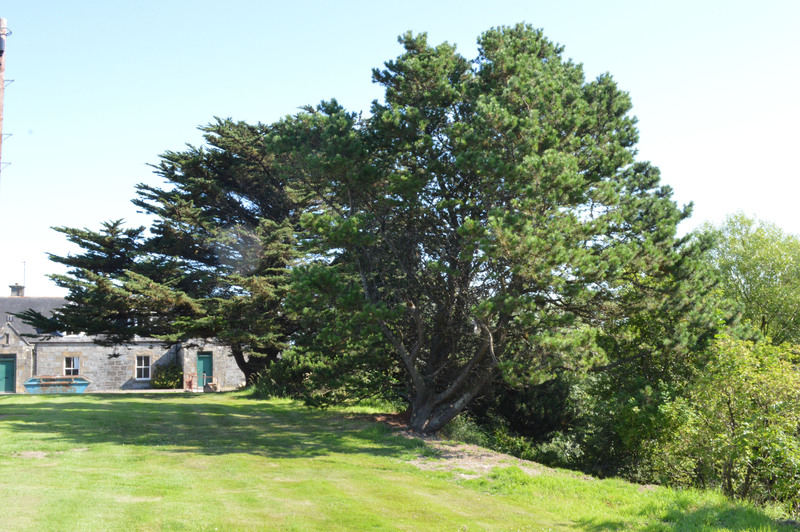 And if the distillery is silent, as it was when I visited, you’ll also get to go downstairs and look past the spirit safe to the stunning view of the sea just beyond. In the visitors’ center, the helpful staff offer tastes of Glenglassaugh’s three current expressions: Revival, Evolution and Torfa. Of course, there are much older bottles for sale dating from 1986 and earlier and costing tens of thousands of pounds, and there’s a cask from which you can fill your own bottle, as many distilleries offer. I tasted it—four years old, 58.6% abv, exclusively Sherry cask–matured, with a nose of candied fruit and brown sugar and a palate full of raisins, stewed plums, honey, caramel and butterscotch cake—and spent the money. Glenglassaugh whisky might be young, but it’s very good. What’s more, the distillery bottles at 46% or 50% abv, giving you more for your money. Revival (46% abv) is aged in a mixture of ex-bourbon and red wine casks and finished in Oloroso sherry casks. It has a plummy nose with notes of grapes, blackberries and vanilla, and a palate of vanilla, honey, red apples, raisins and walnuts. Adding water brings out lighter floral notes. Evolution (50% abv) is aged only in first-fill ex-bourbon barrels and has a vanilla icing nose with a slight hint of pears. It tastes of vanilla, honey, apples, almonds and a bit of citrus. Torfa (50% abv), which means “peat” in Norse, has a campfire-like nose with apples and honey. Its palate is sweet and honeyed with green grass and hay notes. The smokiness is well balanced by vanilla-sugar notes. 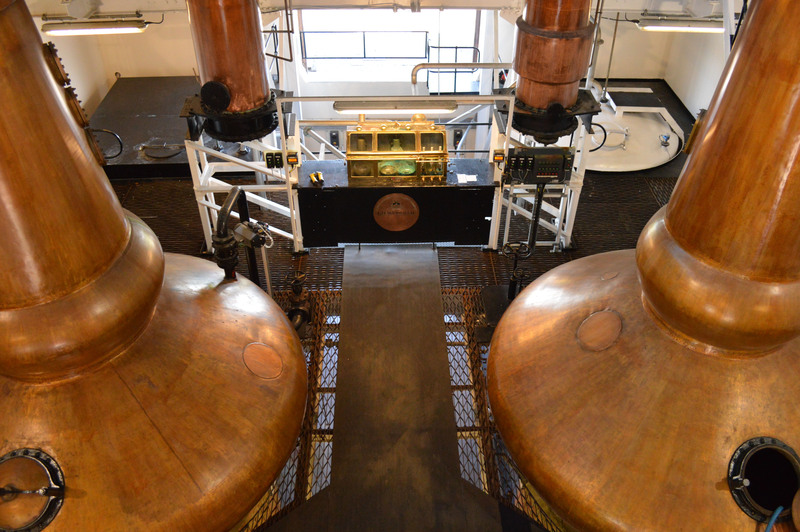 – The distillery does ten mashes a week of about 5 tonnes of grist each time. Fermentation lasts three to four days—nearly double a normal fermentation—to bring out more fruity characteristics in the final spirit. 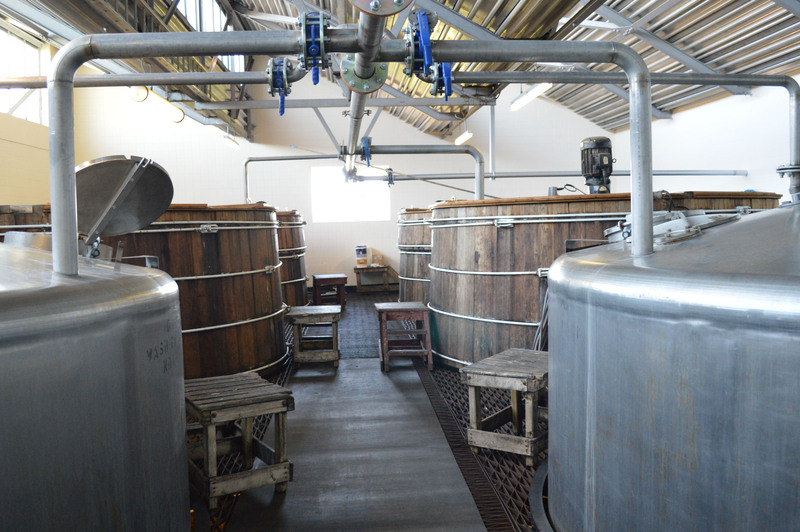 – Local spring water from nearby Portsoy is used for mashing and fermentation (though Ian Buxton has a lot to say about Glenglassaugh’s water in his book), and the distillery uses all Scottish barley. – Glenglassaugh does one run of peated malt per year for its Torfa expression, with phenols at about 30 ppm. I sadly have not made it along to Glenglassaugh, although that’s probably not surprising, given I live on the complete opposite side of the world. But after reading this article I’m kinda keen! Next time I’m in Scotland I’ll certainly look them up! The cask strength does sound rather nice! Out of the other three, which was your favourite expression? It’s definitely worth the drive, Nick! Glenglassaugh is still flying under the radar in many ways, and you’ll likely end up having a very personalized tour. 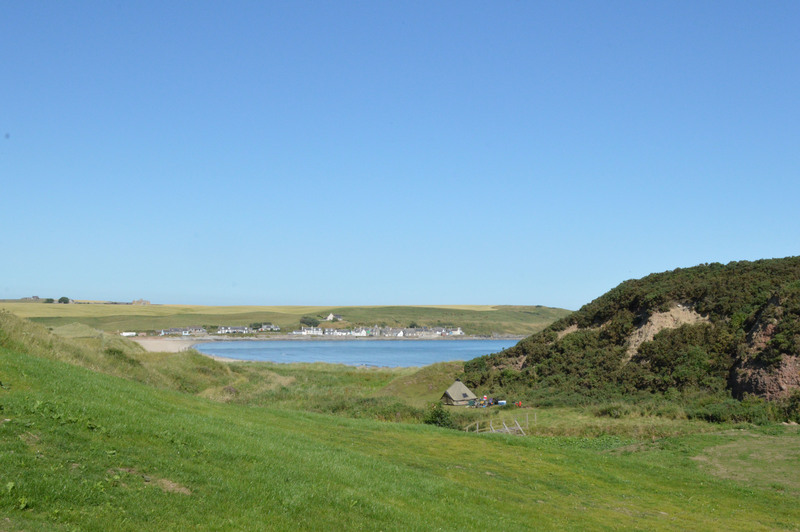 Plus, you can tack on a fantastic walk along the beach and clifftops afterwards! I like all three of the current expressions but if I had to pick a favorite, I guess it’d be Revival. It’s pretty satisfying for such a young whisky—keeps giving up new flavors as you sip. I can’t wait to see what it tastes like in four or five years!